Wanna see how we decorated our house (and the beach house) for Christmas? We have a ton of photos for you, so let’s get right into it. Since we got an entirely new exterior for Christmas (literally all I wanted for Christmas was a white brick house, ha!) we had so much fun trying some new things out front. We did some simple warm white exterior LEDs (why are those so hard to find?!) on the trees on each side of the door. Remember I upgraded those to these larger faux ones because I can’t kill them and the taller height looks nicer on the porch with all the white brick. Those pots are actually the same ones we have had for 4+ years… I just spray painted them “Copper Rose” by Rustoleum (built in primer for the win – took about 30 minutes tops). Oh and we switched out the lights by the door for these slightly wider & bigger ones. And of course I added my magnolia wreath that I make at this fun Wine & Wreath event that I go to with some of my favorite ladies every year (and every year my wreath gets bigger… I’m learning to let go you guys). This year we also added two fresh 14′ evergreen garlands from Trader Joe’s (just $7.99 each!) and I gotta say, we love the real greenery so much that I think that’ll be an annual tradition right along with my wreath-making pilgrimage (John strung up some more of the same warm white LEDs in there and we put the garland lights and the potted plants on the same automatic timer so they switch on and off every night on their own). Other than that we just have our favorite LED battery candles in all of the front windows (more timers for the win! no running around turning them on and off every night – they’re completely autopilot!). We debated adding some more lights to the bushes and I’m not gonna lie, I campaigned hard for these white deer for the porch… but John was just not that into them. So while the exterior decorations don’t exactly rival the Griswolds, we do have FOUR CHRISTMAS TREES INSIDE (!!!) so our Christmas spirit is still alive and well. I can’t wait to take a picture of the house all covered in the ultimate holiday decoration… snow! I might just lose my mind when I see it blanketed in fluffy white stuff for the first time. So, picture of that to come! We also grabbed one more of those fresh 14′ garlands from Trader Joe’s to hang around the windows in the kitchen, which only took a few minutes (we just tapped a small picture nail into the top of the molding on each side of the window – which is also how we hung the one outside around the door surround). They’re such small nails that we put into the very top of the trim in both cases, so they’re basically invisible. So lazy me is debating just leaving them there year-round so they’re ready to hold garland each December. 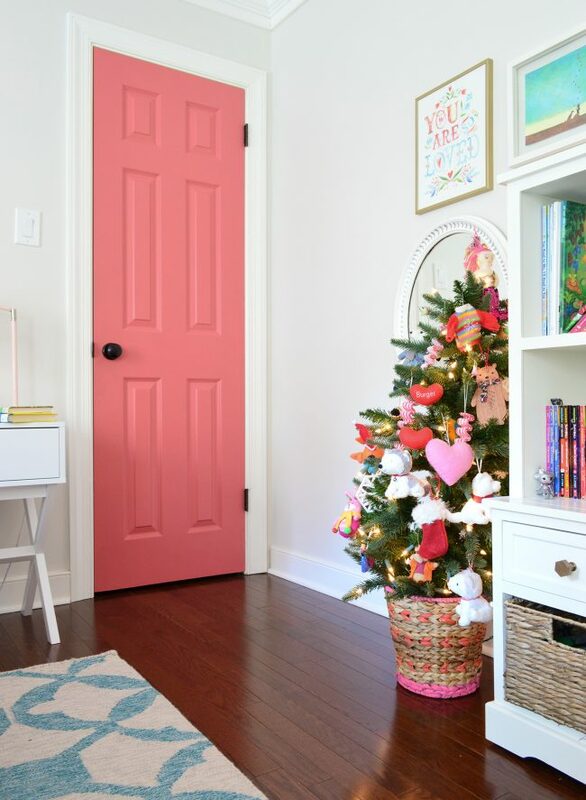 I also tucked a few of my favorite little holiday things around the house, like these pink wooden trees that I got a few years back, which I stuck together in a group on our living room built-ins. 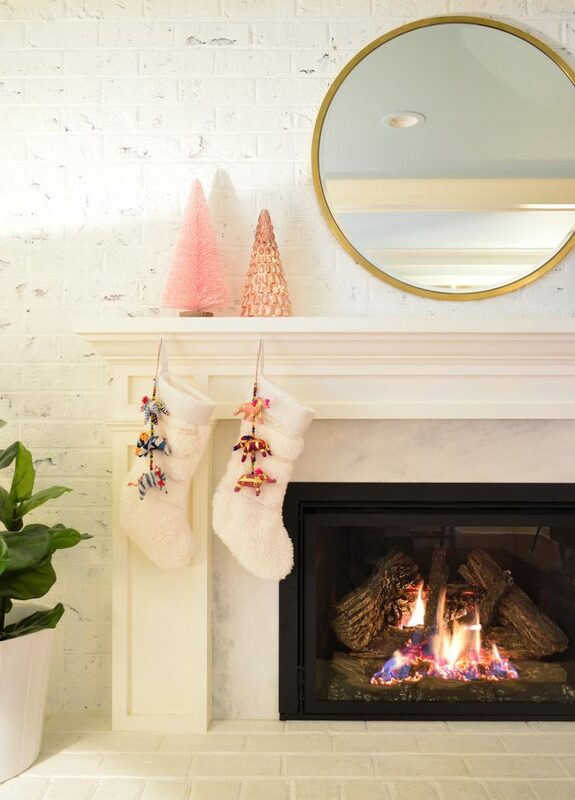 I kept the mantel simple this year with one of my favorite big pink bottle brush trees (it’s from Target years ago but here’s a similar one). 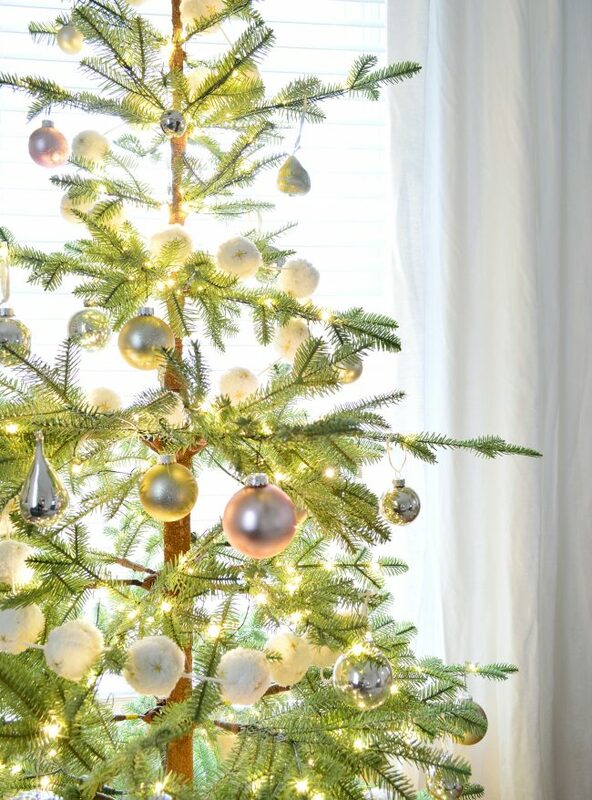 I also added a pink mercury glass tree that I picked up (one of my only holiday buys this year – they’re just so sweet I couldn’t resist – and they have little lights inside that glow thanks to two small batteries in the base). On the other side of the mantel is a little faux flower pot that I got maybe 6 months ago at Target (they didn’t sell them as holiday decor – I think they were actually out in the spring) but they look so festive with their red & green (and pink – ha!) tones to me. 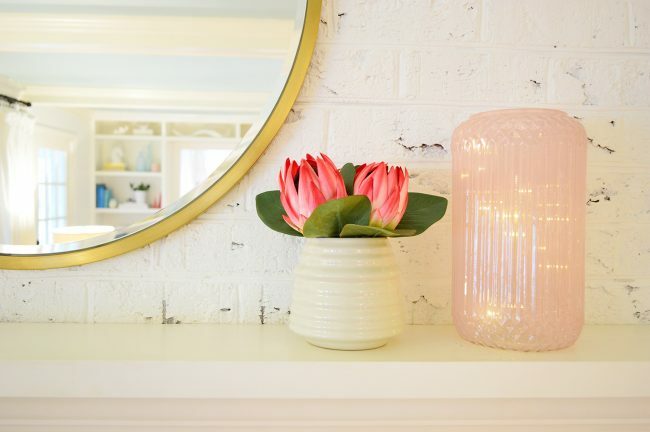 And then I dragged in this pink vase I got maybe a year ago (sadly no longer sold) and added a little strand of battery lights to the inside because DANG IT’S SO CUTE balancing out the glowing pink tree on the other side of the mantel. This is the exact tree we have (I think, they keep moving the link & changing the name) and it hasn’t had a “theme” in years. We just pile it full of handmade ornaments from the kids and friends and things we have made ourselves (like these silhouette & handprint ornaments and these made from kid-art along with ornaments we’ve collected over the years, or during our travels. Viva la mish-mash! The kids’ stockings are the same ones I got a few years back (here are some similar ones). Each year I add little elephant chains (random alert!) just because it’s a fun pop of color and hey, if I can’t get John to go for leopard print stockings, at least I can get some sassy little elephants in there. 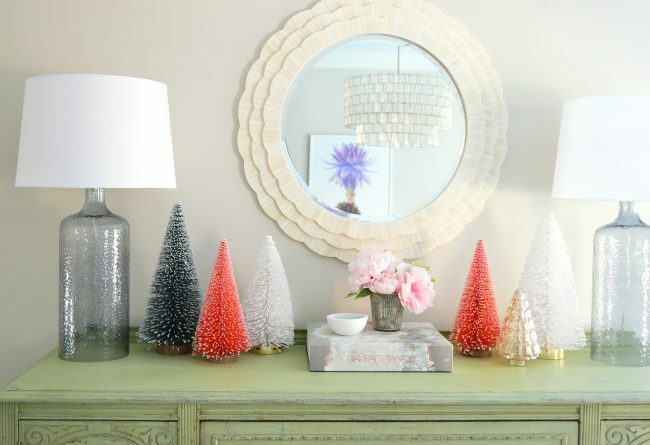 Over in the dining room I grouped my remaining bottle brush trees (all collected over the years – here are some similar ones) on our old green sideboard and called it good. 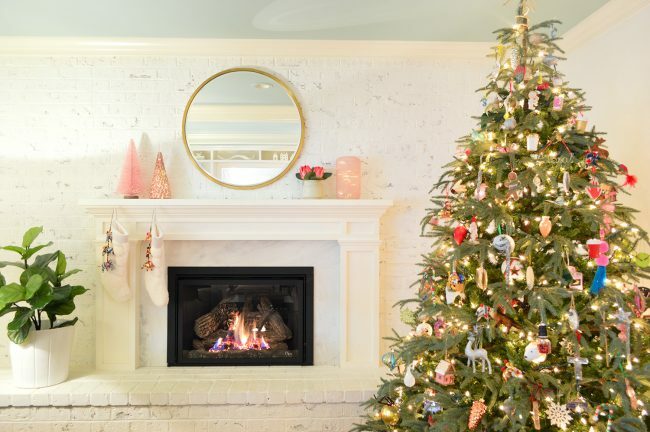 But about those four Christmas trees I mentioned… while we’re pretty minimal with most holidays (like zero decor for Saint Patrick’s Day or Valentine’s Day or Thanksgiving) I think Christmas is just our fav. And I can’t tell you how much we enjoy seeing this little tree glowing in the bonus room window at the end of the hall. We spend movie nights in here and can even see it glowing in the window when we pull into the garage, so it’s a nice spot for a little tree. And the kids love hanging the mostly felt & plush stuffed ornaments all over it – complete with the abominable snowman on top. Oh and just like we do downstairs, we use a faux sheepskin rug around the base. We only need one for this little tree, and our main tree in the living room gets three. Another tree lives in our son’s room, and it’s a retro feeling green tinsel one (here’s a similar one) with colorful lights that our boy picked out himself last year. It looks really fun with his bright green closet door (it’s Irish Moss by Benjamin Moore). Also that sequin banana ornament is from Target and he loves it. Oh and the wooden reindeer next to the tree was made by John’s grandpa many decades ago. Before bed each of our kids walk into the hallway and ask Alexa to turn off their tree and it magically goes off, which thrills them to no end. Speaking of which, John “Lover Of Smart Tech” Petersik made a quick video to show you how a smart plug can make turning a tree on and off whenever you want a LOT easier (especially one with the plug in an annoying spot). You don’t need Alexa or some other hub for this plug, by the way – you can just control it from your phone, which is nice. 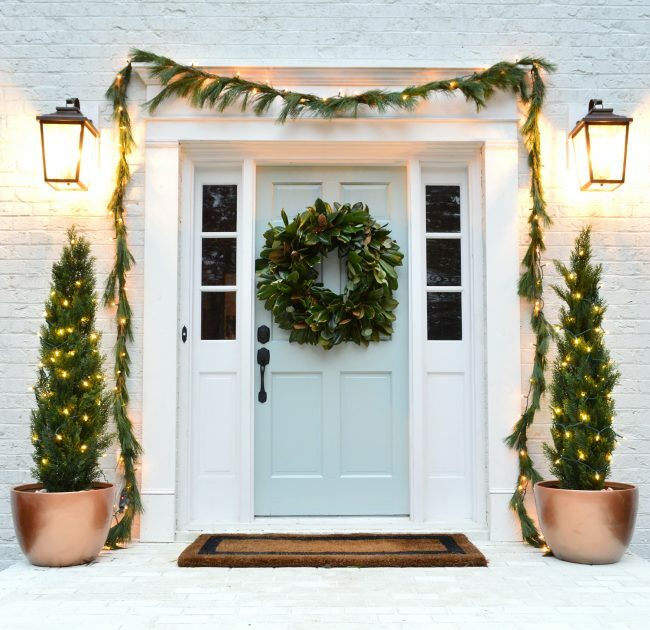 Sure, we could put this tree – or any of our other trees – on a basic timer like our exterior lights, but we love that we can turn on all the trees in the morning with one command (you can bulk multiple actions to happen at once). And similarly, we can turn all four of our trees off at once if we’re running out the door to a meeting or dinner. Note: You may need to click through from your blog reader to view the video player. And you can watch it on YouTube here. 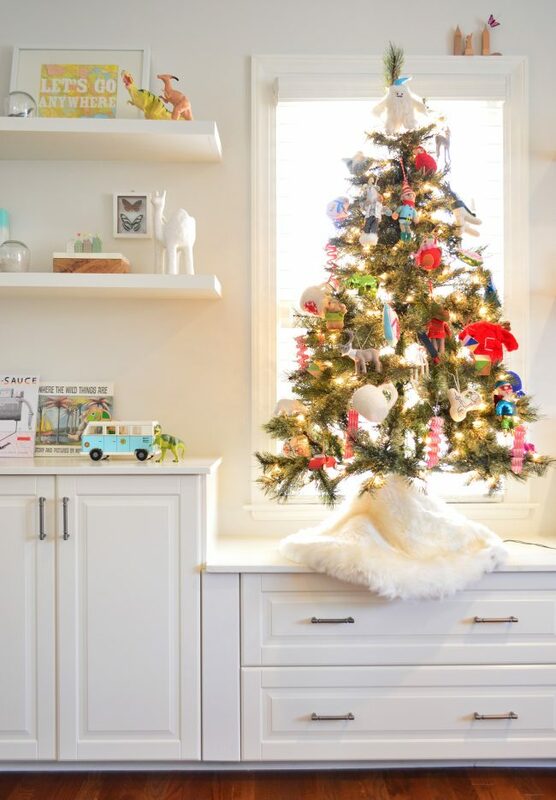 Our daughter has also loved having a tree in her room for a few years now (here’s a similar one) and she takes great joy in redecorating it pretty much every morning. 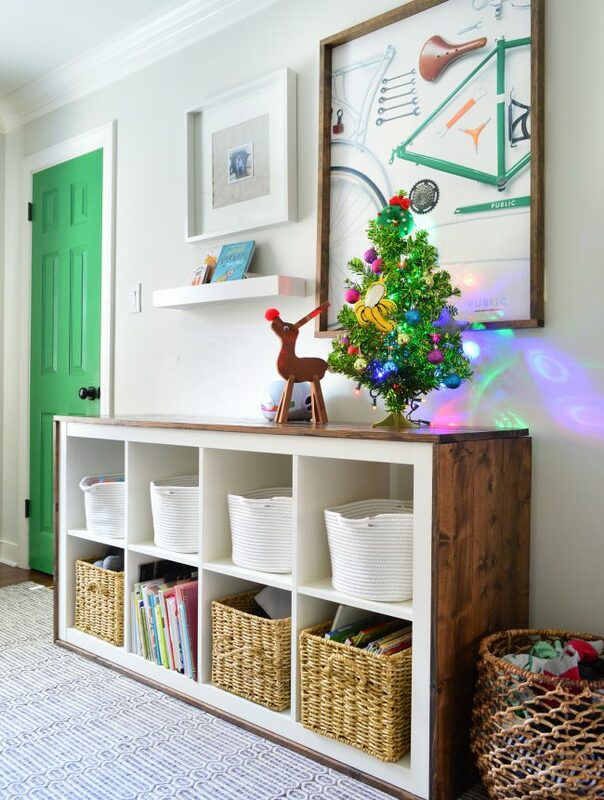 I like sticking her tree into a colorful basket that I painted (it’s a fun deviation from having a tree skirt – and it looks cute with her bold closet door, which is painted Cinco De Mayo by Benjamin Moore). 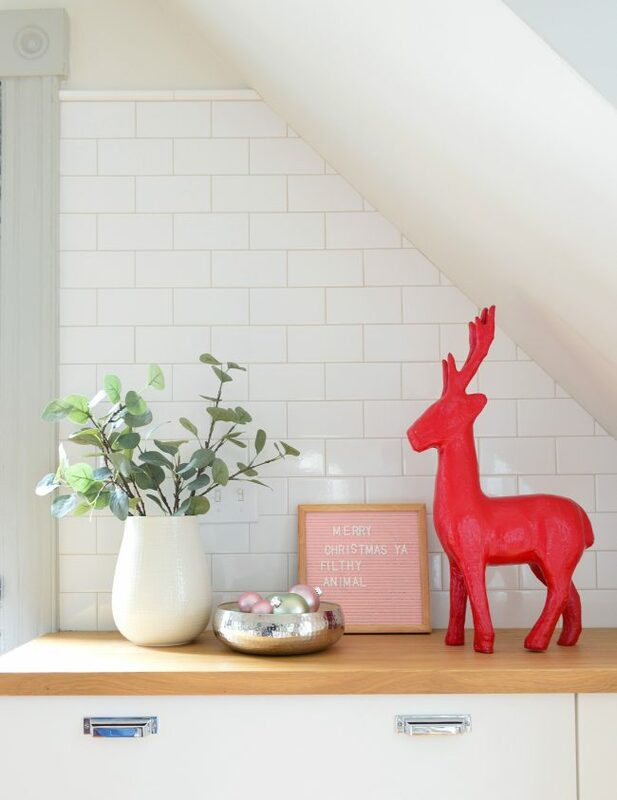 If you listened to our latest podcast, you know we thinned out our decorations in an attempt to keep things simpler this holiday season (since I’ve been working on simplifying the house in general over the past year, I didn’t want to undo all my efforts by cramming every surface with holiday decor). And thanks to that paring down session, we ended up with a bunch of “overflow” holiday decorations that we could bring to the beach house! We’ll be spending some time there with family over the holidays too, so we were really excited to decorate it for the first time. 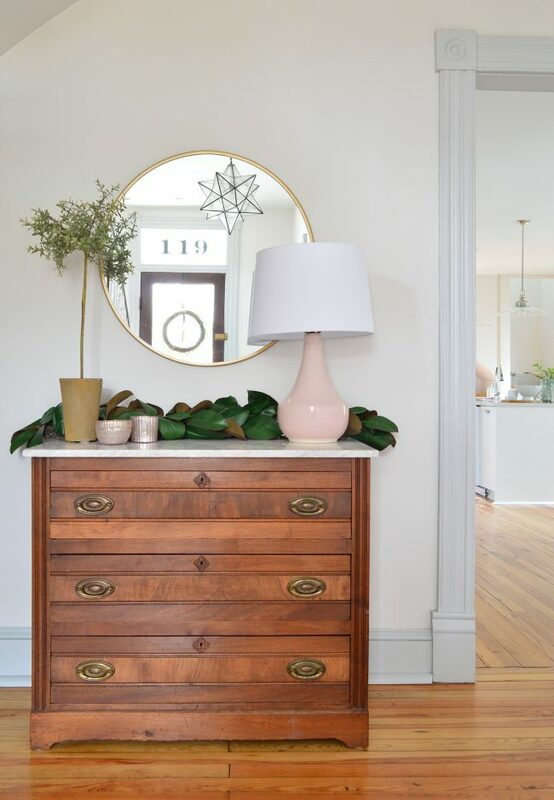 So three cheers for not spending a ton of money throwing all the things into my cart at Target, and getting to basically decorate this entire house with leftover stuff (aka: free!!!). 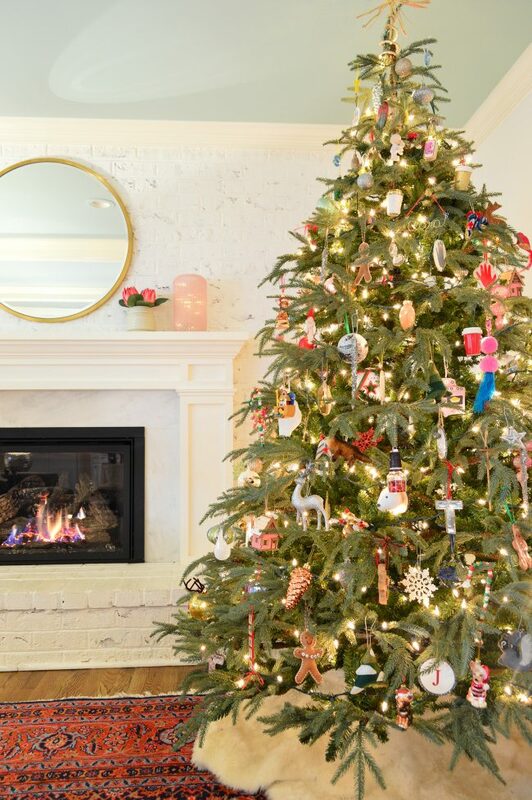 I did purchase one tree – but literally even the ornaments on it are things we already had, so I’m calling it a win. You probably remember seeing these red boots with faux evergreen branches all over our house (both out on the porch and inside under the console table, depending on the year) and now they’re living it up at the beach house, along with these little faux trees that used to be on our porch before we upsized them. 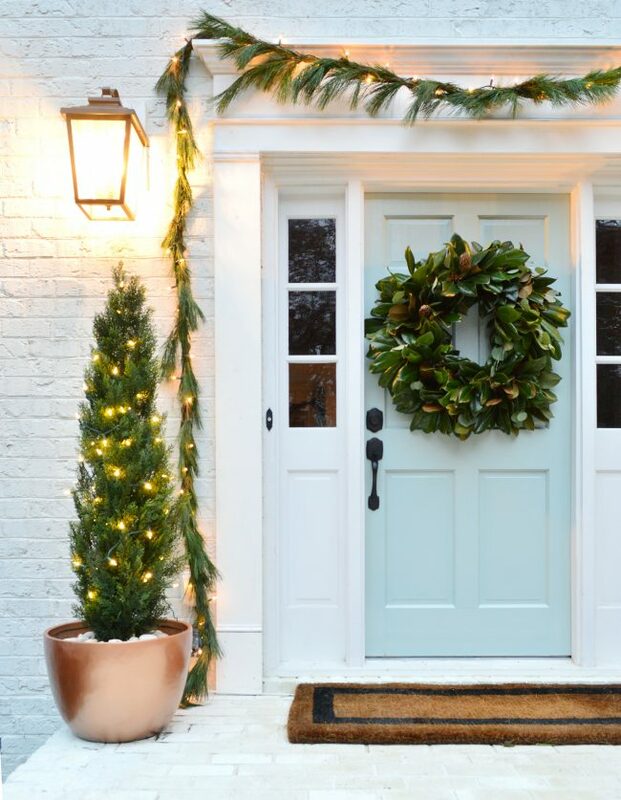 The wreath on the door is one that we bought last year but they still sell it (I LOVE the little gold bells with the gold transom numbers over them). 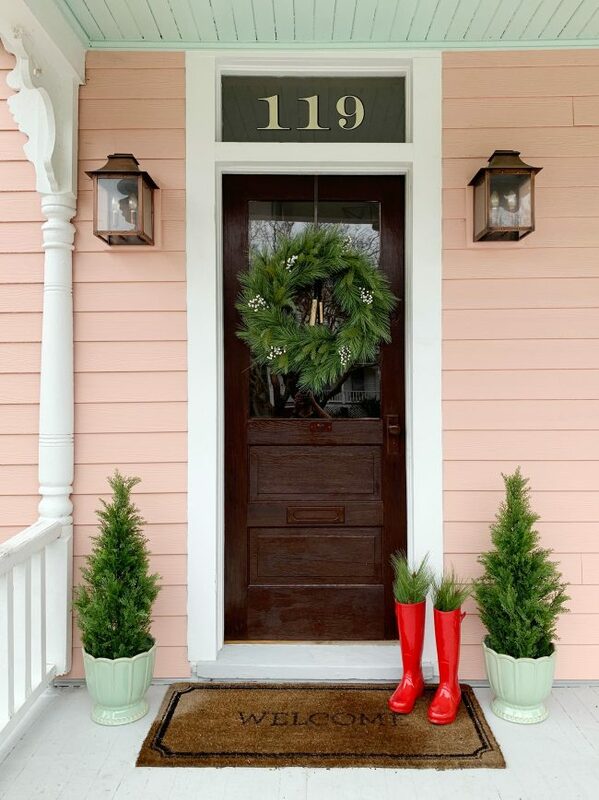 Everything was so simple to plop down on the porch, and I love the bright red color of the boots with the pink siding (see this barn for more on my love of pink & red together for the holidays). Inside you’ll probably remember this faux magnolia garland as the one I used last year on the mantel. I liked keeping the fireplace mantel more cleared off next to the big green tree this year – and adding our garland to this table was a nice way to bring some rich green color into our mostly-white-and-gray entryway. 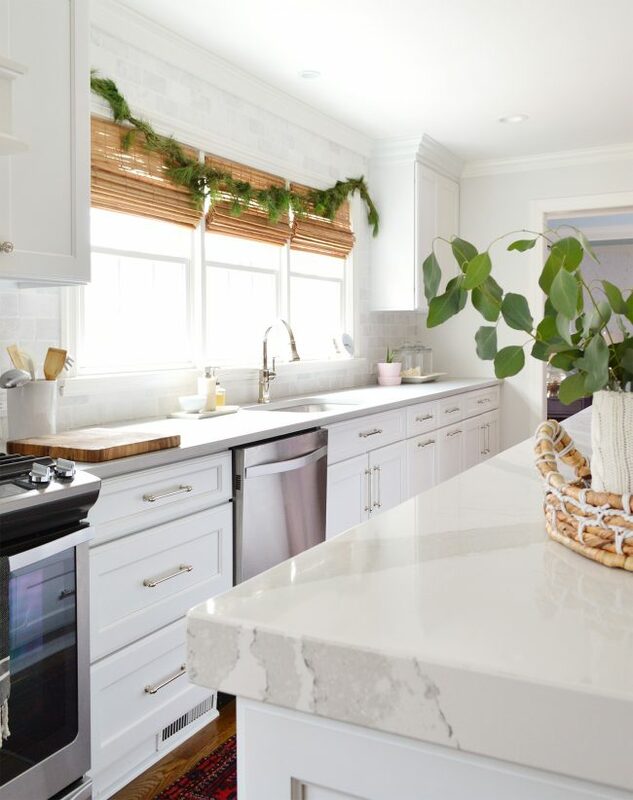 Plus I was able to double it up so it looks extra thick on that marble top (more on that amazing dresser here). Over in the living room is the tree we bought – the single solitary purchase we made for the entire beach house decorating effort. 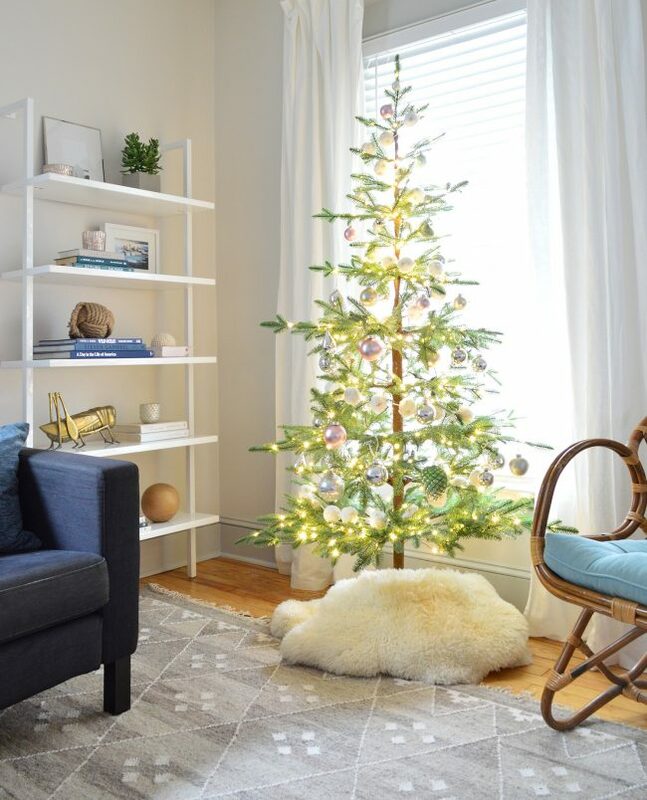 I’ve always wanted one of these “Charlie Brown Christmas Trees” with charmingly sparse branches – and they had a big pre-holiday sale so I got this 6.5′ one for around $160. Oh wait, but we did buy the garland! I love that little yarn pom-pom stuff. It took three of them to do our 6.5′ tree and honestly if there had been four that would have been even better, but I got the last three. Over in the back wall of the kitchen are a few other things I’m sure you’ll recognize if you’ve seen past holiday tours. Like these red reindeer that I painted seven whole years ago (how does time fly that fast?!?!) and a hammered bowl full or ornaments I’ve had forever on all sorts of surfaces. I also added a few feather trees to the kitchen and the pantry and in about 4.5 seconds it was feeling pretty jolly. My favorite thing is the letter board my girl did for me. I gave her free reign and just said “how about a holiday quote?” You can tell we watch a lot of Home Alone around here. The funny thing is that John later remembered that I put that same quote on a black letter board last year. Apple doesn’t fall far from the tree. And I like her spacing better than mine. 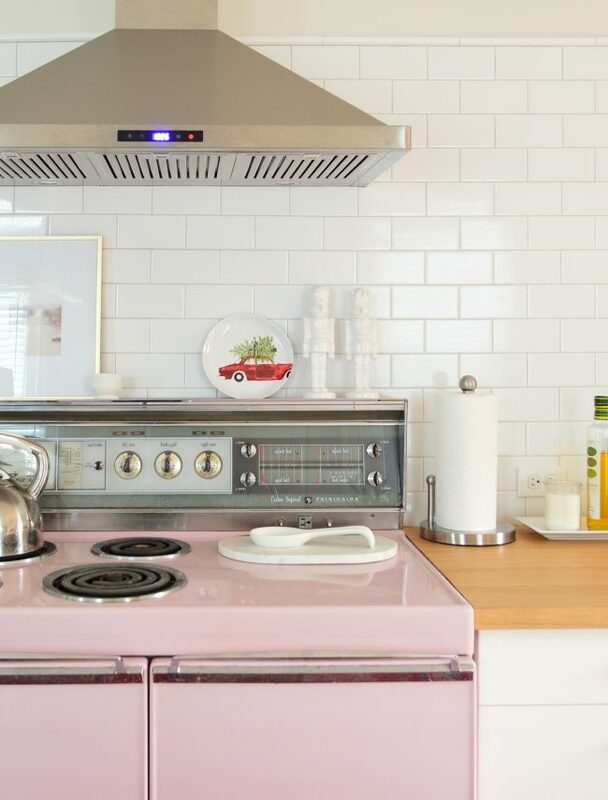 Over by My Favorite Pink Stove Of All Time (yes, that’s its proper name), I leaned up a little plate I got a few years back (here’s a similar one) and two white ceramic nutcrackers I’ve had for years. 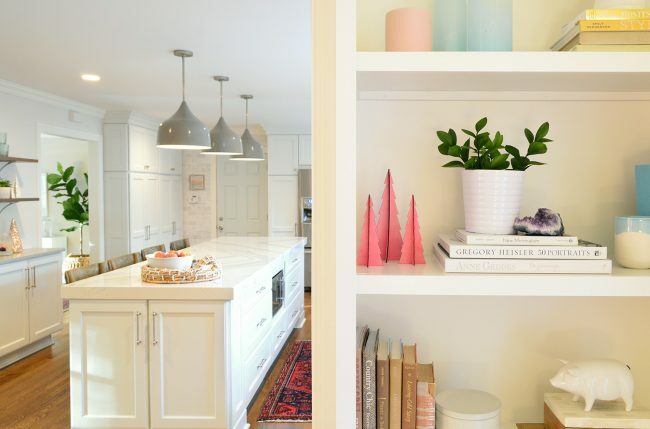 It’s so sweet how just a few things can make the entire kitchen feel ready to host a whole group of friends and family. I love that it doesn’t take much!